When we started section hiking the Appalachian Trail, we had some ups and downs (other than just the literal uphill and downhills of the trail). Some hikes went really well and others were so tough. After one notably tough hike, we were rallying our psychological spirits for the next one. Looking at the map, we saw all these camera icons scattered across the next section. This seemed promising. Camera icons meant views. This nudge was what we needed to get back out on the trail. And so we set up a shuttle from Mountain Harbor Hostel to Carvers Gap. We drove as early as we could up to Carvers Gap and immediately had our breath taken away. The catawba rhododendron were blooming. We had no idea that these flowers would be just the tip of the iceberg of the beauty we would see. The winding trail to Round Bald, which passes through a perfectly spooky but also serene pine forest in between two sections of open hillside captured our all of our senses. The view from Round Bald took our breath away. We watched clouds roll through the valley below us and we continued on, hiking down through orange flame azalea patches, and then up Jane Bald to an iconic view of the Blue Ridge mountains through rhododendron. We had a 14 mile day planned but plenty of time, allowing us to stop and take photos wherever we wanted. After Jane Bald, we climbed down and then halfway up to Grassy Ridge Bald, turning left to follow the Appalachian Trail. After some more ups and downs, we turned off to explore the Overmountain Shelter, a bright red barn with its own lovely view. After the Overmountain Shelter, we had a steep climb up Little Hump and then Big Hump balds. Finally, we entered the woods on the other side of Big Hump mountain. Within 10 minutes of each other, I severely sprained my ankle and the skies opened up with torrential downpour. We used the adrenaline from the ankle injury to make as much ground as we could and then hunkered down in a shelter through the worst of the rain. We finally made it to Mountain Harbor hostel and our shuttle driver agreed to take us up to Carvers Gap even though we were about an hour ahead of our planned shuttle time. He didn’t bat an eye at our completely soaked state of affairs. Then again, he barely said a word on the 45 minute drive up the mountain. Fresh clothes were waiting for us in the car and we had the rest of the afternoon and evening to repeat over and over again that we would be coming back to do this hike as often as we could. Carvers Gap is right on the border of North Carolina and Tennessee. It’s a popular place so plan ahead. And plan to leave no trace to protect the beauty of the area for generations to come. 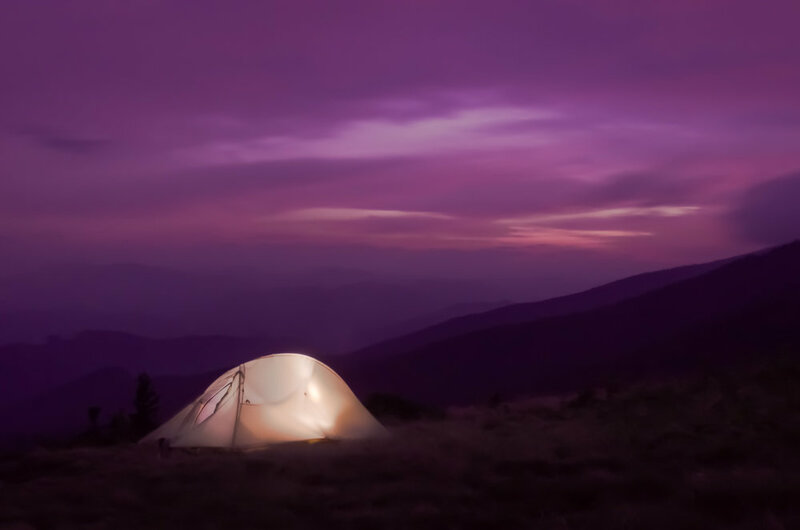 You can camp along the AT or in nearby Roan Mountain State Park. Mountain Harbor Hostel, which we used to arrange a few shuttles while we were hiking in the area operates a hiker hostel as well as a bed and breakfast.